'''Rainbow body''' (Tib. ''ja lü'') Fully accomplished [[Dzogchen]] practitioners can dissolve their body at the time of death. Through the practice of [[Trekchö]], the practitioner can attain the so-called ‘rainbow body’, in which the body becomes smaller and smaller as it dissolves, emanating rainbow light, and finally only the hair and nails are left behind. Through the practice of [[Tögal]], the practitioner can dissolve his or her body into the ‘Light Body’ (Tib.'' ö ku''), where the body transforms into light and disappears completely into space. This was done by [[Garab Dorje]], [[Manjushrimitra]], [[Shri Singha]], [[Jnanasutra]] and [[Vairochana]]. Another accomplishment of Tögal practice is the ‘Rainbow Body of Great Transference’ (Tib. ''ja lü phowa chenpo''), where the master dissolves his body into rainbow light and lives for centuries in order to benefit others. Such was the case with [[Padmasambhava]], [[Vimalamitra]], [[Nyang Tingdzin Zangpo]] and [[Chetsün Senge Wangchuk]]. [[Image:Dzogchen A.jpg|frame]]'''Rainbow body''' (Tib. [[འཇའ་ལུས་]], ''ja lü'', [[Wyl.]] '' 'ja' lus'') — fully accomplished [[Dzogchen]] practitioners can dissolve their body at the time of death. *Through the practice of [[tögal]], the practitioner can dissolve his or her body into the ‘Light Body’ (Tib. 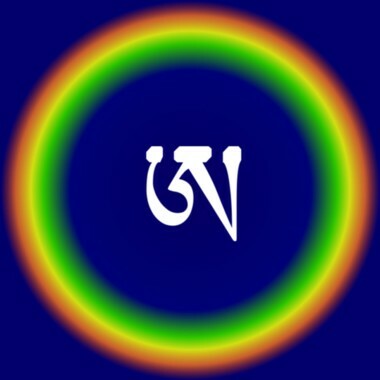 འོད་སྐུ་, ''ö ku''), where the body transforms into light and disappears completely into space. This was done by [[Garab Dorje]], [[Manjushrimitra]], [[Shri Singha]], [[Jnanasutra]] and [[Vairotsana]]. *Another accomplishment of tögal practice is the ‘Rainbow Body of Great Transference’ (Tib. [[འཇའ་ལུས་འཕོ་བ་ཆེན་པོ་]], ''ja lü phowa chenpo''; Wyl. '' 'ja lus 'pho ba chen po''), where the master dissolves his or her body into rainbow light and lives for centuries in order to benefit others. Such was the case with [[Padmasambhava]], [[Vimalamitra]], [[Nyang Tingdzin Zangpo]] and [[Chetsün Senge Wangchuk]]. See ''[[The Tibetan Book of Living and Dying]]'', pages 171-173. *[[Sogyal Rinpoche]], ''[[The Tibetan Book of Living and Dying]]'', pages 171-173.